This was the Yankees' fourth shutout of the season, all in their last 18 games, starting with June 10 at the Mets, and three times in their last seven games. Prior to this run, they had not been shut out in their previous 111 games. Their last shutout at Yankee Stadium was on August 2 of last season against Detroit. This was their largest loss since August 27, 2007 at Detroit, 16-0, and their largest loss at home, which ironically came in the same month, (8/14/07) against Baltimore, 12-0. The 11-0 win by Boston tied for second in their biggest shutout win over the Yankees, matching a win on September 6, 2003, just behind their 13-0 win on May 30, 1941, per @ktsharp. The Yankees were out-hit 17-2, which marked just the sixth time since 1908 they allowed at least 17 hits while collecting two hits or fewer themselves. The last time that happened was on May 20, 1990 against Kansas City, when they were outhit 17-2 in a 4-3 10-inning loss. Prior to this game and since 1908, the most hits they allowed against Boston in a game they had two hits or fewer was 16 hits on May 30, 1941 in a 13-0 loss. 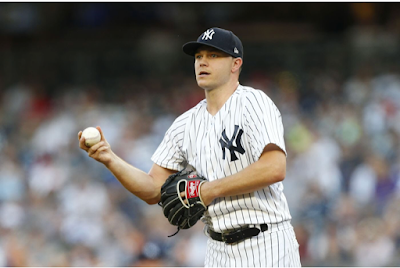 From the start, you could tell this would be a different kind of game than Friday night, as Yankee starter Sonny Gray did not have it. After getting Mookie Betts to fly out to right field, and Andrew Benintendi to groundout, it was all downhill from there, starting with a J.D. Martinez hit up the middle that second baseman Gleyber Torres was able to make a play on, but Martinez beat the throw. Mitch Moreland followed with a walk, followed by a Xander Bogaerts single to load the bases. Rafael Devers was up next, and he launched a grand slam into the seats in left to make it 4-0, and was really all their starter, Chris Sale, needed. Boston kept it going In the second, as Benintendi laced an RBI single, followed by a J.D. Martinez sacrifice fly to make it 6-0. Gray was gone soon after, as he was pulled in the third with two on and one out. In the latest in a long line of disappointing starts, Gray lasted just 2 1/3 innings, allowing six runs on seven hits and two walks, with no strikeouts, to fall to 5-6 on the season with a 5.44 ERA. This is the second time this season he has allowed six earned runs, both against Boston, with the first instance coming on April 12th at Fenway Park. This was the second-shortest non-injury shortened start of his career, as he went just two innings in a start for Oakland against Detroit on April 27, 2016. Gray now has the highest home ERA by a Yankee, at 7.10, minimum 13 starts, per @baseball_ref. When the Yankees acquired Gray from Oakland last summer, it looked like they were getting a pitcher that would be second or third in their rotation. Instead, he is at the point, you wonder if they should have gone with rookie Jonathan Loaisiga on normal rest in this one. After Gray left, Adam Warren pitched a scoreless 2 2/3 innings , providing the lone bright spot of the night for the Yankees. Giovanny Gallegos, who was just making his third appearance of the season, was next out of the Yankees bullpen, and Boston got it going against him. In the sixth, Martinez got an RBI single, followed by a two-run blast from Sandy Leon into the second deck in the seventh that made it 9-0. Gallegos was sent back to Triple-A after the game. While Gray has not worked out with the Yankees, Boston's Chris Sale has certainly worked wonders for them since coming over from the Chicago White Sox before the 2017 season. Sale improved to 8-4 on the season as he went seven innings, and allowed just one hit, one walk, and one hit batsmen, with 11 strikeouts. Sale is the first Boston pitcher to toss seven scoreless innings and allow one hit or fewer against the Yankees since Greg Harris on June 7, 1990 at Fenway Park, when he threw eight shutout innings of one-hit ball. The last Boston pitcher to do it in New York was Ray Culp on September 21, 1968 when he allowed one hit in a complete game. This was Sale's 16th career scoreless start with at least 11 K's, marking the fifth most by a Major League pitcher since 1908, joining Nolan Ryan (37), Randy Johnson (34), and Pedro Martinez and Roger Clemens (who both had 19) in the exclusive club. Sale and Gray are an interesting case study in who can make it in Boston and New York, as there were questions about both when they arrived. Would Sale be able to stand the pressure of Boston after such incidents in Chicago such as cutting up throwback jerseys because he didn't like them? Would Gray, a southern kid who spent his whole career in Oakland, be able to pitch in New York? Sale went 17-8 in his first year in Boston, proving his big contract was worth it, and dominating against the Yankees. Gray, on the other hand, just can't cut it in New York, with this outing possibly the most glaring example of that. One thing is for certain: It certainly was historic.